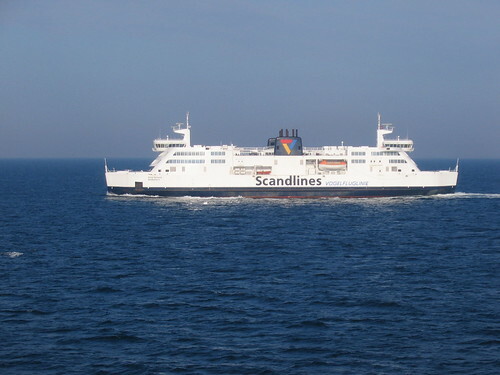 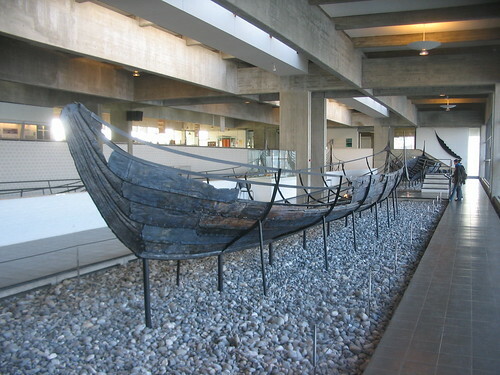 Having arrived in Denmark by train ferry, the next morning I caught a train north to Helsingør, or Elsinore as the Danes insist in calling it in English, and then continued by ferry across the Øresund, the strait separating Denmark from Sweden. 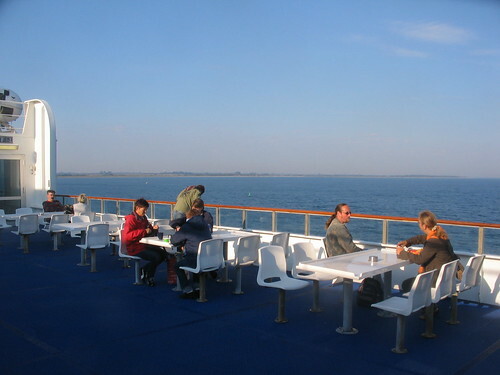 Preliminary research had told me that an “Around the Sound” ticket was available, valid for rail, bus and ferry travel on either side of the Øresund. 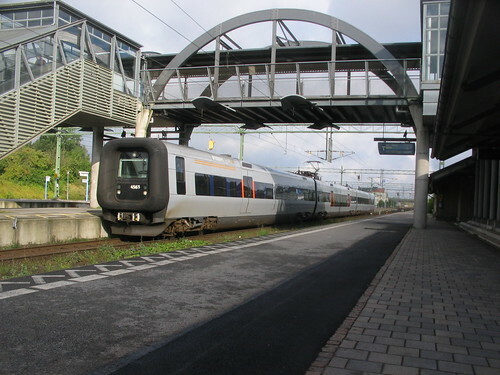 It gives unlimited regional travel in the relevant bits of Denmark and Sweden, plus a single train journey across the Øresundsbron international bridge, and one trip in the opposite direction on the Helsingør – Helsingborg ferry. Unfortunately, it turned out that this useful sounding ticket is only sold in Sweden. 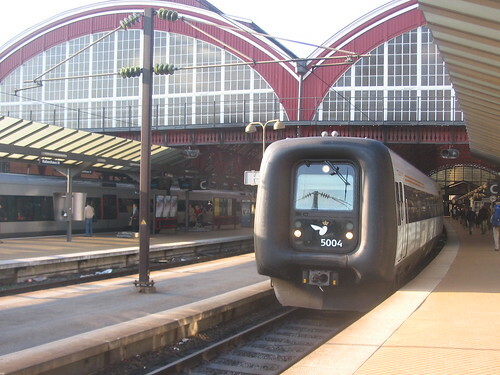 The staff at København’s main station were obviously used to dealing with misinformed tourists, and so issued me with the appropriate single tickets for today and tomorrow instead. 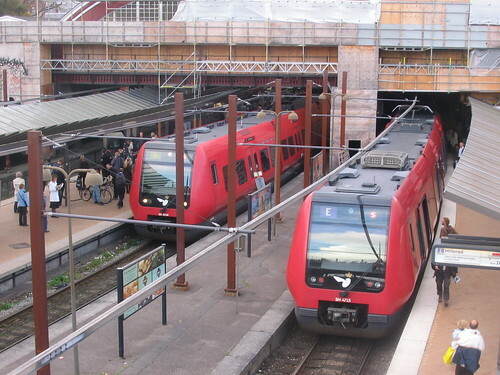 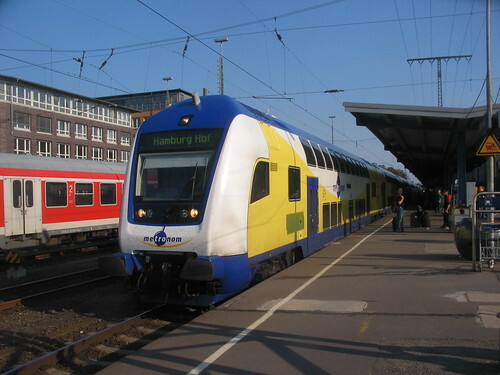 The frequent international train services around the Sound are run by a fleet of Adtranz EMUs, “rubber ring” ended sets equipped to run on 25 kV AC at the Danish side and 15 kV in Sweden. 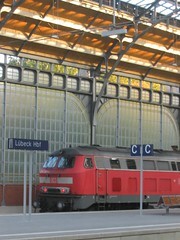 The interiors are spacious, but the trains have had some technical problems since they were introduced. 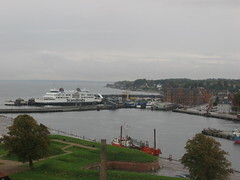 On the coast 46 km and 44 min north of København, Helsingør is the Danish end of the U-shaped cross-Øresund service, and trains terminate in a large harbour-side station which is fully integrated with the adjacent ferry terminal. 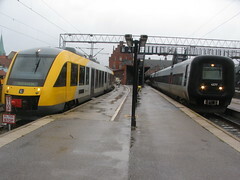 While I was looking round a modern DMU crept in through a gap in the wall on the landward side of the station. 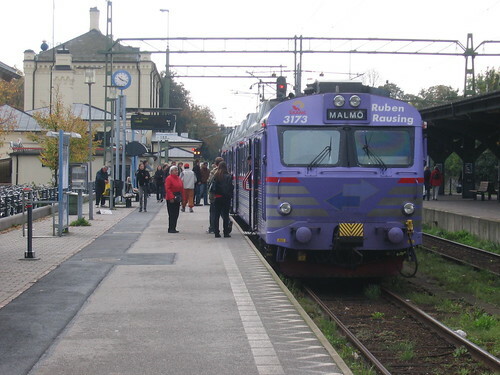 This is the Hornbækbanen, a 25 km local railway independent of state railway DSB, but I wasn’t sure where the train might be going or how to buy a ticket, so gave it a miss. 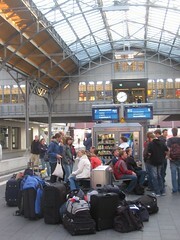 After lunch it was time to go back through the rain to the station, into the ferry terminal and onto the next sailing for Sweden. A continuous shuttle of boats makes the 20 min crossing between Denmark and Sweden, visible through the drizzle across the Sound. It isn’t very far across, just 4 km or so, and the guns of Kronborg Castle allowed Denmark to control access between the North Sea and the Baltic. Denmark charged a toll to allow ships to pass, but by 1857 the rest of the world had got so fed up that they clubbed together and gave the Danes a huge wodge of cash to scrap it. 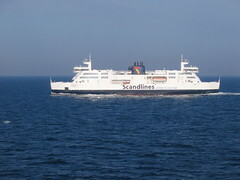 Passengers are disgorged from the ferries into a modern terminal at Helsingborg, the Swedes carrying as much beer as then can carry over from Denmark, where prices are marginally less obscenely high. 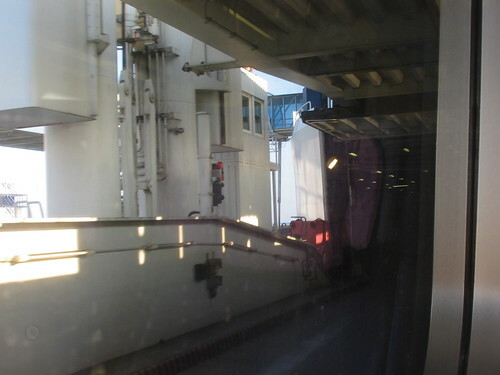 The trains are hidden beneath the ferry terminal, on an underground line paralleling the shore. I boarded another Øresund EMU, which would have left Helsingør 2 ¼ h before on its U-shaped journey. 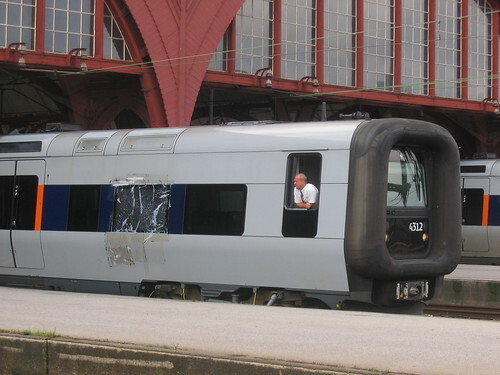 Many of the EMUs had the leading window of the middle carriage smashed and temporarily covered with a plastic sheet, apparently down to the actions of stone-wielding yobs in an area of Malmö (or at least that’s what a Dane told me – a Swede might blame the Danes). 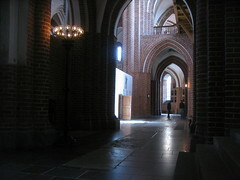 I took the train as far as the cathedral and university city of Lund, which shares a name with a small village in East Yorkshire (common Viking heritage?). 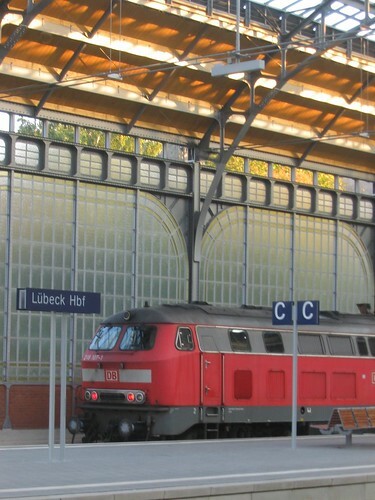 København’s Youth Hostel is a towering multi-storey monstrosity, but Lund has a somewhat cosier hostel formed from a rake of old Swedish Railways sleeping cars, parked permanently in a siding behind the station. 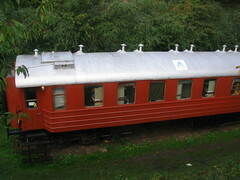 One car houses the kitchen and dining room, one car the showers and others form the dorms. Inevitably it is a bit cramped, but it works. 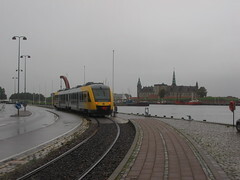 The next morning I continued on to Malmö in a rather startlingly purple local EMU, operated under a regional concession by our own Arriva. 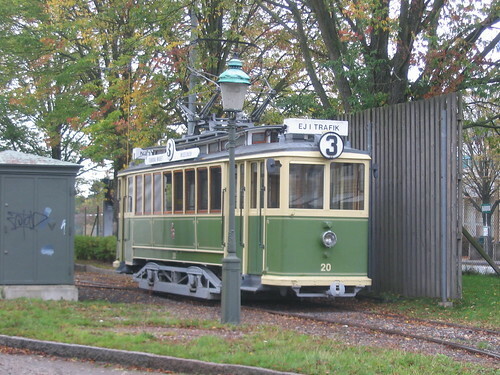 Malmö’s Technical & Shipping Museum has a couple of steam engines, some planes, a submarine, and a heritage tramway which runs round the outside of a fortress and a picturesque fish market. 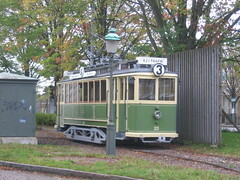 The city’s last regular trams ran in 1973, but the short museum line opened in the summer of 1987 to recreate the experience. Unfortunately it wasn’t running during my visit, which is perhaps not surprising as I had the museum almost to myself. 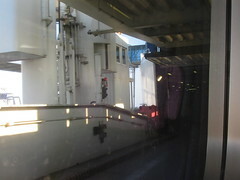 On the way back to the station I called in at the exhibition centre of the Citytunnel project. 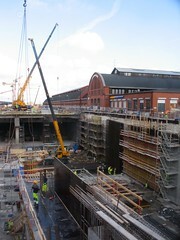 A new tunnel is being bored beneath the city centre, converting the existing terminus station into a through station. 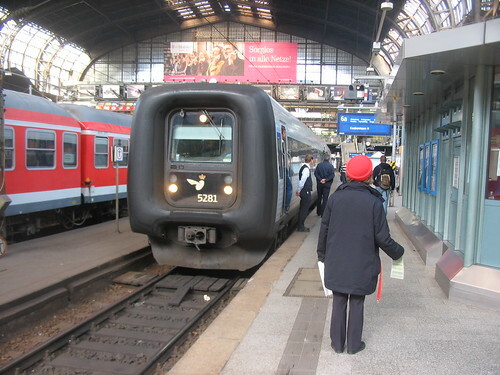 Trains to Denmark currently leave Malmö in the wrong direction, encircling the city in a wide loop to reach the Øresund bridge. The new tunnel will enable direct running, knocking a few minutes off the journey and eliminating the need for trains running further into Sweden to reverse in the station. The construction site itself was visible to the public, with the work observed by the usual collection of old men who gather wherever there is a hole in the ground to be peered into. 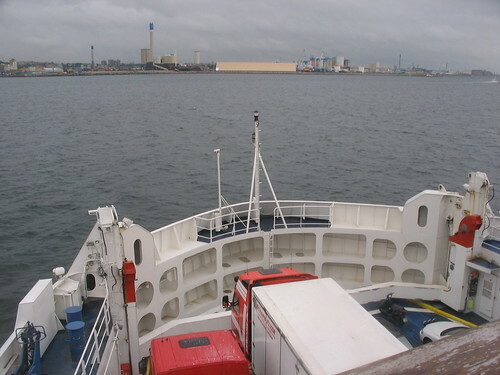 Back on another Øresund train we passed round Malmö, before coming to the huge cable-stayed bridge linking Sweden to Denmark. Approach bridges more than 3 km long lead on and off the main span of 490 m, held 55 m above the sea by four 204 m pylons. 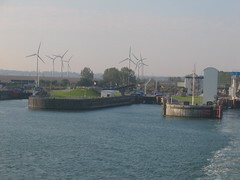 Double decks carry the motorway above the railway as far as the artificial island of Peberholm, where road and rail switch to run through the four parallel tubes of the world’s longest immersed tunnel. 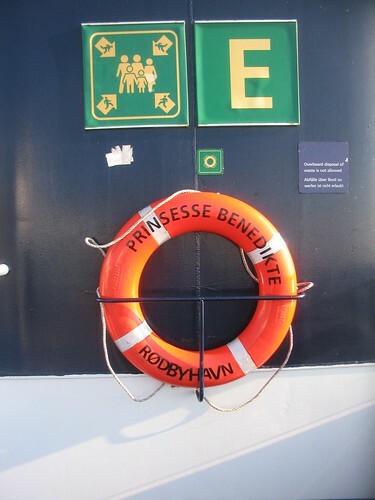 Opened by Queen Margrethe II of Denmark and King Carl XVI Gustaf of Sweden in July 2000, the bridge provides the final connection in a fixed link from Sweden to Germany, completing the route which began with the bridges taking trains between the Danish islands. 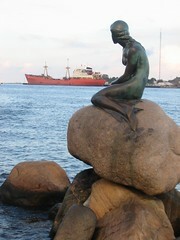 Not long before I arrived it had been announced that international traffic over the Øresund bridge had exceed Danish domestic traffic over the Storebælt from Jylland for the first time, a significant and symbolic step in the re-orienting of the cross-border region’s business, transport and residential patterns triggered by the bridge.